For over 50 years the finest Apple Cider Vinegar has been produced. 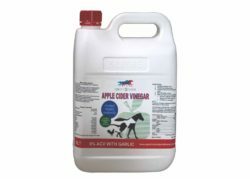 Apple Cider Vinegar taken as part of a holistic approach to animal health and welfare enhances wellbeing by, amongst other features, modifying the intestinal environment to a pH suitable for beneficial bacteria to function optimally. Apple Cider Vinegar (ACV) is rich in nutrients and trace elements essential for a balanced diet. Suitable for all animals ACV can be administered diluted to their water supply or applied to dry feeds. Garlic Supports the Immune system while Honey aids palatability and provides a slow release energy source and Vitamin B1 is an essential dietary vitamin.